This set of Power Electronics Aptitude Test focuses on “Single-Phase FW AC-DC-4”. Therefore, 1000/2.5 = 400 V.
2. A single-phase full converter bridge, is connected to a RLE load. The source has a rms voltage of 230 V and the average load current is 10 A. Find the firing angle for which the power flows from AC source to the DC load. Consider E = 120 V, R = 0.4 Ω. Substitute the given values to discover α = 53.208°. 3. A single-phase full converter bridge, is connected to a RLE load. The source has a rms voltage of 230 V and the average load current is 10 A. Find the firing angle for which the power flows from the DC load to the AC source. Consider E = 120 V, R = 0.4 Ω, L = 2 Henry. Note that as the power is flowing from DC to AC E has to be negative. Use 1 to find the firing angle. 4. For the below shown converter configuration, find the expression for the average value of voltage across the resister R with Vs = Vm sinωt and firing angle = α. Explanation: Vo = Vo = 1/π x [∫ Vm sinωt d(ωt)] where the integration would run from α to π. 5. 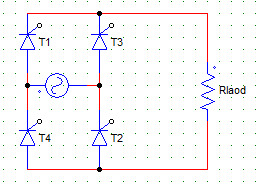 A single phase full controlled bridge converter is connected to load having R = 0.4 Ω, E = 120, L = 0.2 mH, Vs = 230V. The RMS value of load current is 10 A for a firing angle of 53.21°. Find the input power factor. Vs x Irms x cosɸ = E Io + Irms2 R.
6. A single phase full converter feeds power to a RLE load with R = 6 Ω and E = 60 V. Find the average value of the load current when the supply voltage is 230 V rms AC and a firing angle = 50°. I = Vo – E/R = 133.084-60 / 6 = 12.181 A. Explanation: PIV for M-2 is Vm = √2Vs = √2 x 200. Explanation: Each device would conduct for β-α. Explanation: If the resistance of the load circuit is increased then the ripple content of current increases. Explanation: It depends on both as firing angle will decide how fast and how much current flows. 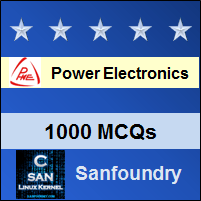 The load R, Rl or RLE can also effect the current depending upon the values of L and E.
To practice all areas of Power Electronics for aptitude tests, here is complete set of 1000+ Multiple Choice Questions and Answers.